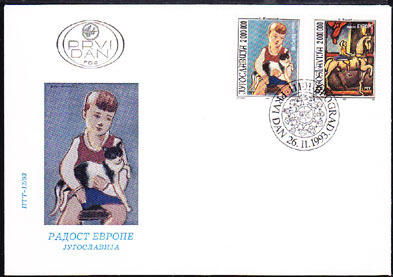 61118 FDC YUGOSLAVIA (1993) Boy with cat*. Circus Rider*. FDC. Europa paintings. Scott Nos 2225-6, Yvert Nos 2495-6. 77543 MAX FRANCE (1993) "Les Muses" by Denis. Maximum card with thematic cancel. Scott No 2376, Yvert No 2832. 67932 SPE NORTH KOREA (1993) "Spring on the hill". Minisheet of 5 specimens. Scott No 3195, KSC Nos 3310-4. 49143 SPE NORTH KOREA (1993) "Spring on the Hill"*. Set of 5 overprinted SPECIMEN. KSC Nos 3310-4. Scott No 3195. 67935 SPE NORTH KOREA (1993) April spring art festival. Specimen. Scott No 3196, KSC No 3315. 77541 EMA FRANCE (1994) Paint brushes*. Red meter cancel on envelope "Pinceau d'Art MANET Ets Plantefol." 77548 EMA NETHERLANDS (1994) Tube of paint*. Red meter cancel on envelope "Artists' Materials." 77546 EMA FRANCE (1994) Drawing compass*. Red meter cancel on envelope "Atelier de Dessin - Olivier Bourdeau." 60896 MAX LIECHTENSTEIN (1994) Earth*. Air*. Fire*. Water*. 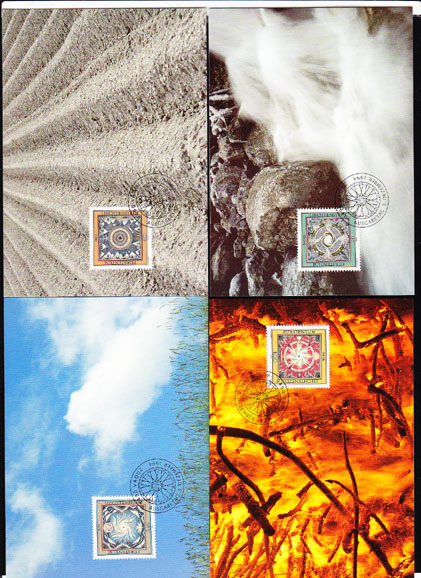 Set of 4 maximum cards. Scott Nos 1039-42, Yvert Nos 1040-3. 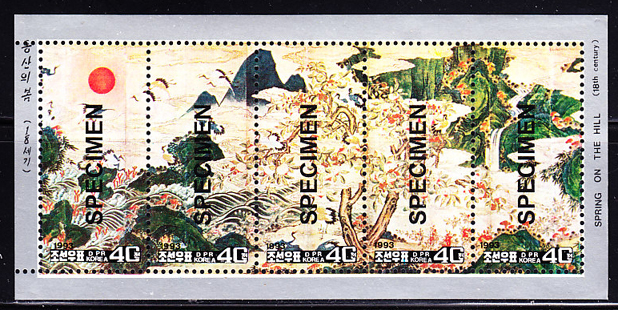 55164 SPE JAPAN (1994) Kyoto 1200th anniversary*. Se-tenant strip of 5 with MIHON (specimen) overprint. Scott No 2440a. 55020 SPE JAPAN (1994) Painting of dry garden*. MIHON (specimen) overprint. Scott No 2441. 55049 SPE JAPAN (1994) Artificial pond*. MIHON (specimen) overprint. Scott No 2442. 77537 OBL FRANCE (1995) Woman in flowery dress*. Illustrated cancel on envelope for Impressionist festival in Chatou. 60891 MAX LIECHTENSTEIN (1995) Paintings of Anton Frommett*. Set of 3 maximum cards. Scott Nos 1048-50, Yvert Nos 1049-51. 55068 SPE JAPAN (1995) Portrait of Woman*. MIHON (specimen) overprint. Scott No 2458. 45423 EP AUSTRIA (1996) "Mother with Child" by Fendi*. Black proof. Scott No 1698, Yvert No 2011. 45424 EP AUSTRIA (1996) "Self-portrait" by Kupelweiser*. Black proof. Scott No 1699, Yvert No 2012. 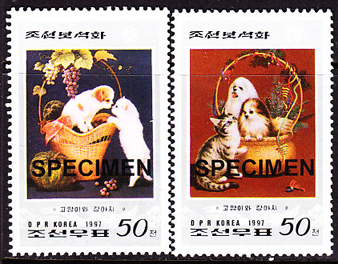 68250 SPE NORTH KOREA (1997) Korean jewel paintings (Cat + Dog). Set of 2 specimens. Scott Nos 3598-9, KSC Nos 3726-7. 45399 EP AUSTRIA (1998) Joseph Binder centenary*. Black proof. Scott No 1750, Yvert No 2074. 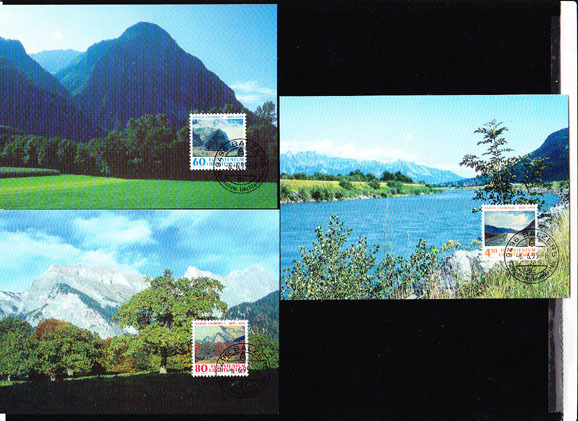 45398 EP AUSTRIA (1998) 100th anniversary of Wiener Secession*. Black proof. Klimt's famous Beethoven frieze. Scott No 1751, Yvert No 2076. 45390 EP AUSTRIA (1998) Painting by Staudacher*. Black proof. Scott No 1771, Yvert No 2097.